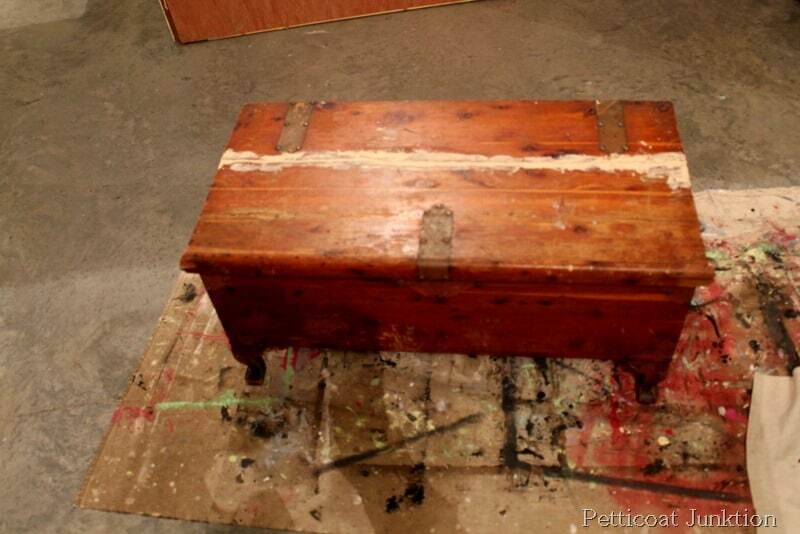 I used the vaseline paint distressing technique on this antique cedar chest. The red and blue color combo is really pretty. I purchased the cedar chest at the Nashville Flea Market. The top was broken completely down the middle. 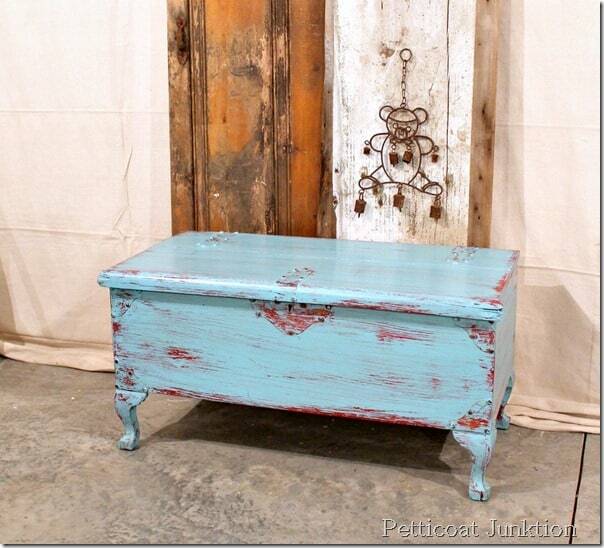 I probably overpaid for it, but I liked the legs and the brass details. 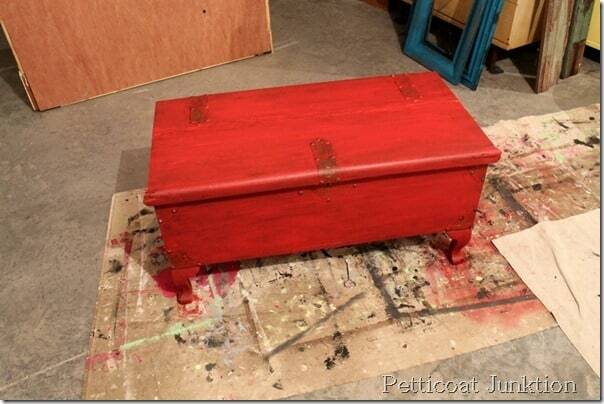 For the makeover I choose this oops paint in cherry red. 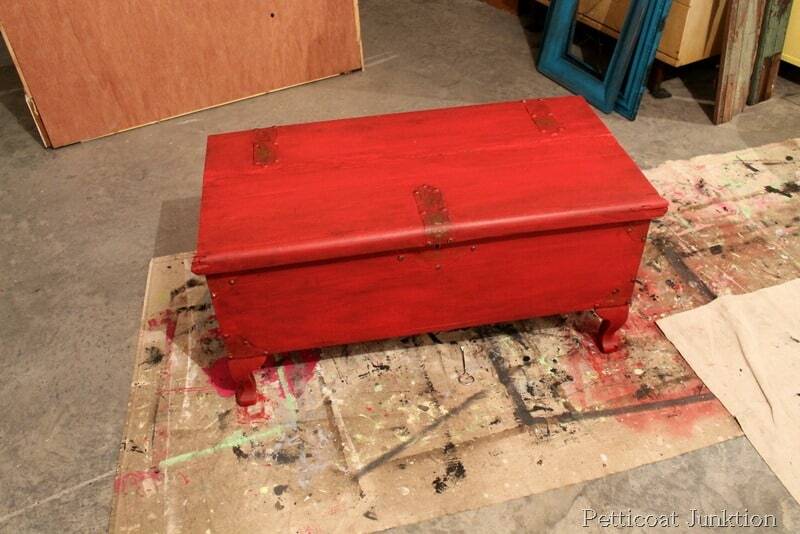 I planned to just paint her red, apply some dark wax, and ta-dah, done. But it was a little too plain for me. 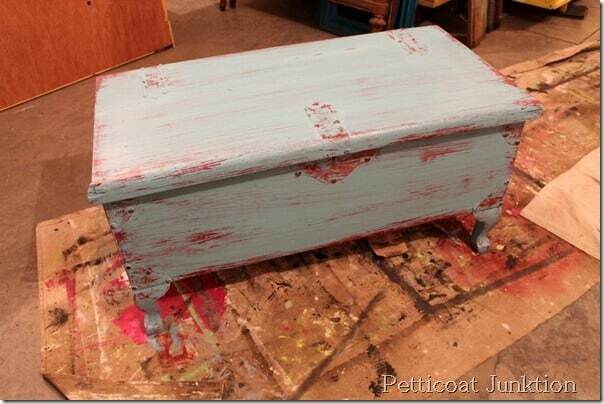 So I pulled out my special mix from the Cherry Red and Turquoise Cedar Chest Makeover. 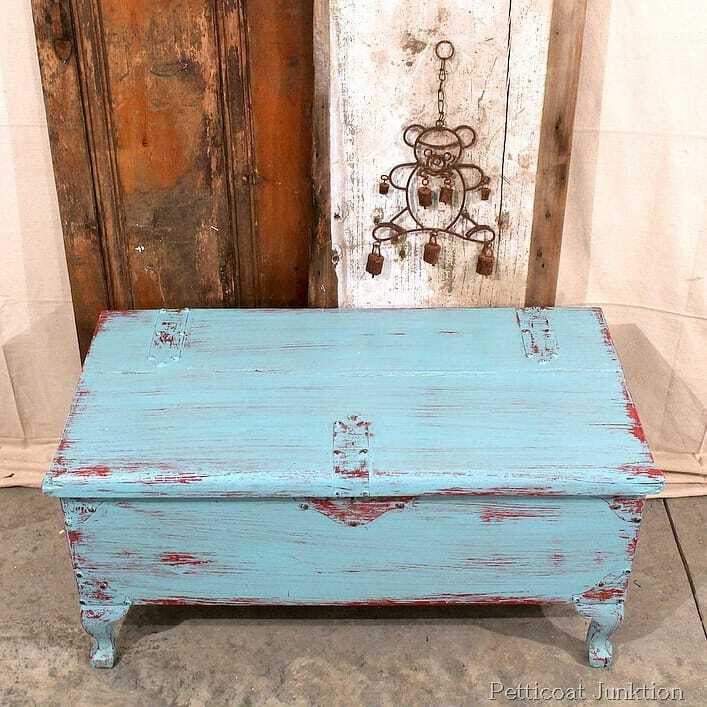 This cedar chest makeover is the reverse of the Cherry Red and Turquoise Cedar Chest Makeover……turquoise on top and red underneath. I tried a different distressing technique this time. I used some of my husbands wet cleaning towels, you know the kind that comes in a canister and you open the tab on the top and pull them out one at a time. Some people use baby wipes but they were in the house and these were handier. I don’t think this is what is known as “wet sanding” so I’m calling it “wet cloth distressing” . 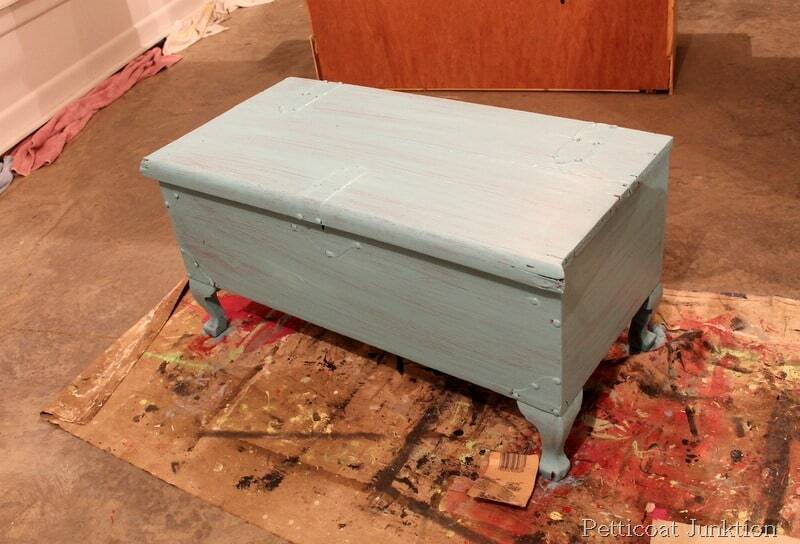 When the top coat of turquoise was dry I rubbed with the wet towel in strategic places. Sometimes I rubbed pretty hard. I think I let the paint dry too long. Rub the paint off until you get the look you want. Next I applied a light coat of Howards Wax in Walnut. Gives the chest an aged look. 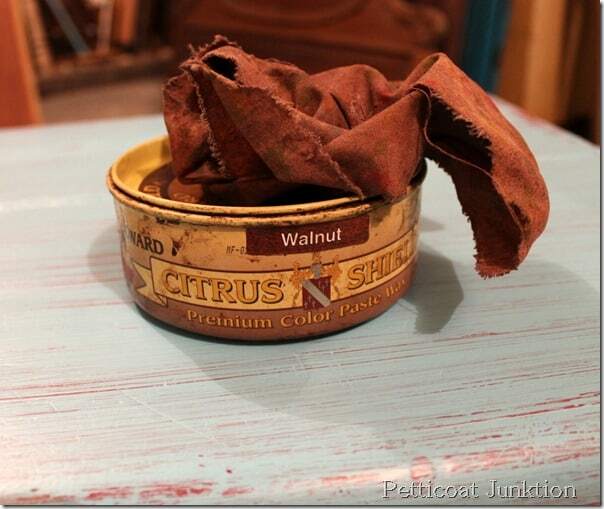 I like the wet cloth distressing, not as messy, but I think it takes longer than using the electric sander. You have inspired me to try to paint a piece for outdoors. Do you use a wax or anything at all to protect your outdoor pieces. I don’t want this piece to simply fall apart. How can I protect it at least for a few years? It depends on the piece and what I paint it with. 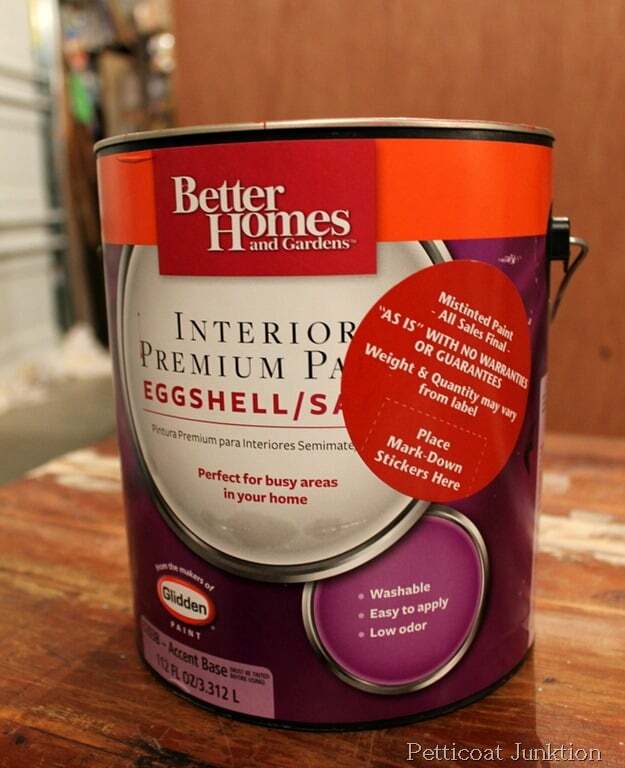 I usually use spray paint that is made for outdoors. I have a question. 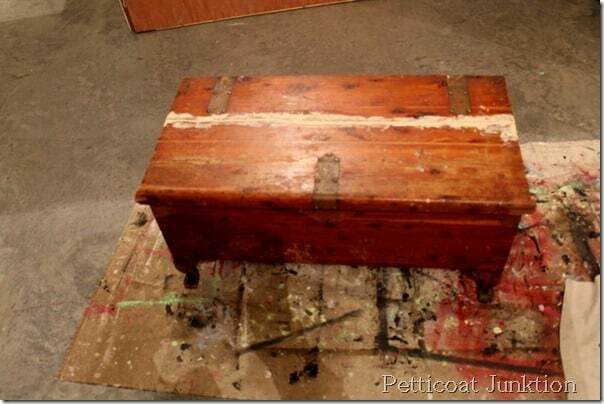 Over the winter we set 2 plants on a cedar chest and one pot left a water mark on the chest. Who do we remove it or get the stain off??? Thanking u in advance for any help. 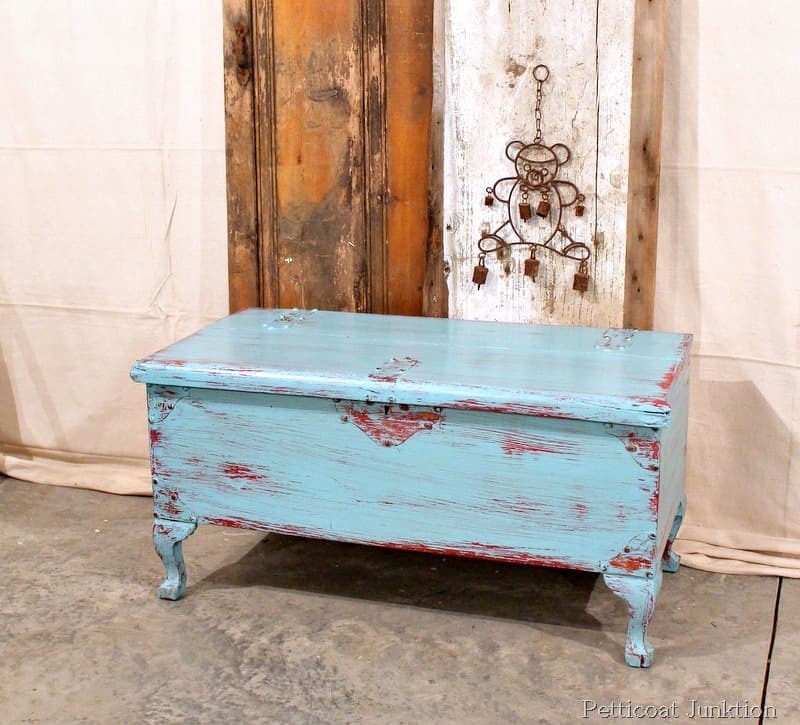 I just finished an old dresser using the wet distress technique. 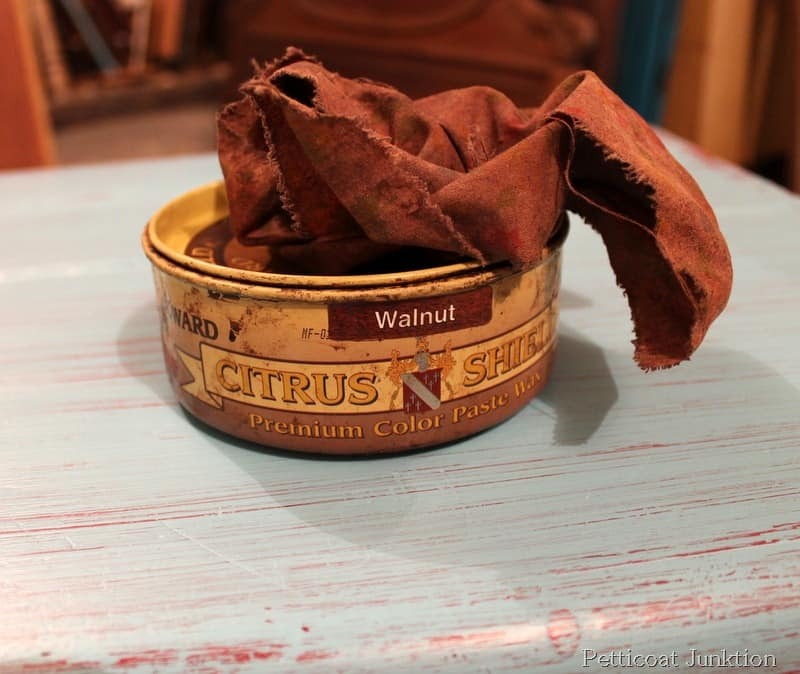 I used milk paint and old flour sack dish towels to wet distress. Was super easy and I think turned out great. I was going for a beach look and it actually turned out looking a lot like driftwood. Just love milk paint for its versatility. 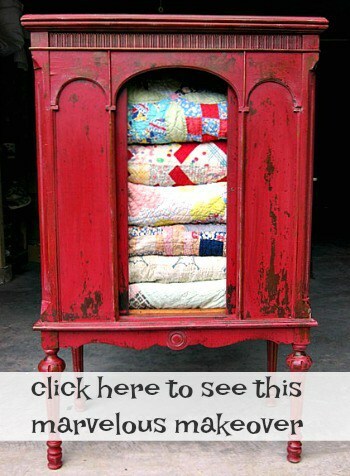 I just love this piece and have a old hutch I going to try it on thanks for the ideal. The chest looks fabulous. Great job! This is gorgeous!! I love it!!! I haven’t seen the ‘wet cloth’ technique but am anxious to try! Thanks for sharing at the TaterTot & Jello Party. PINNED! 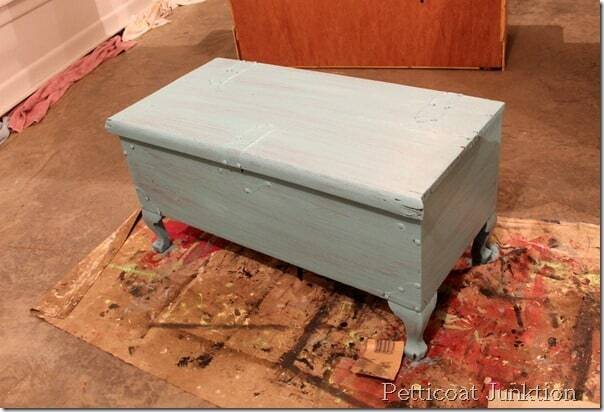 I have a very similar cedar chest that I have wanted to paint for maybe forever. I love how yours turned out. I ALWAYS love your pieces. 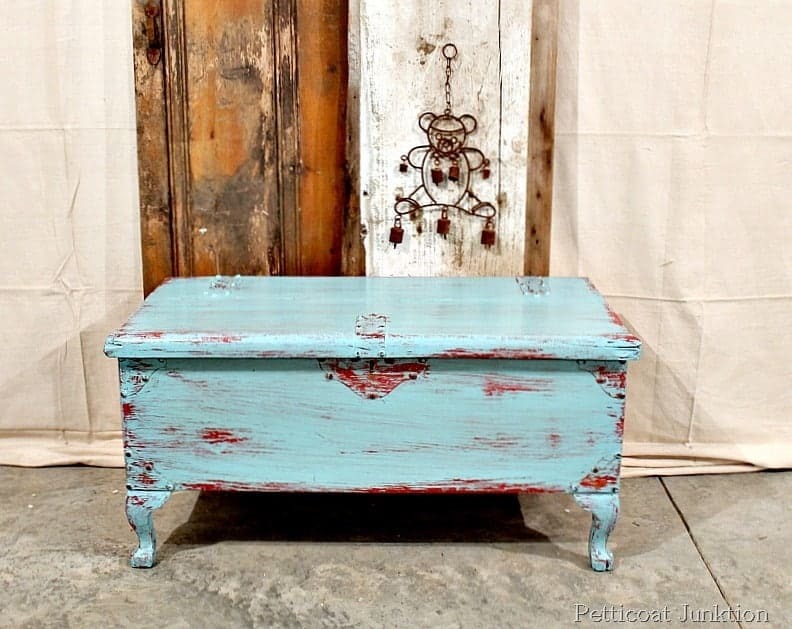 The color combo on this piece is soooo pretty. You always get me in the mood to PAINT !!! 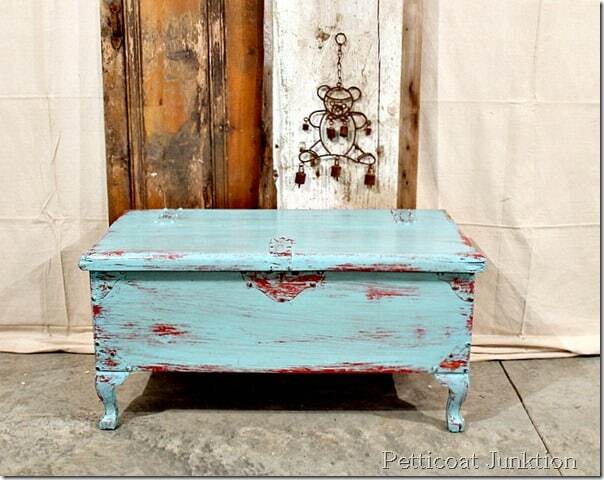 I have true and love the wet distressing, but have only tried with chalk paint. I do most painting inside the house and the wet distressing I can also do inside. Love your work, look forward to seeing each piece! Happy Spring! Thanks Terri, I need lots of positive reinforcement. Please keep stopping by! I love the legs too. 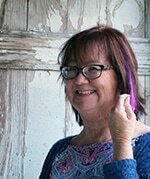 Will be at artisan fair in Franklin, TN on 27 April. Any chance you will be there? Would love to meet you. Oh, Ellen I’ll have to check this out. I haven’t heard of it but if I make it down there I will email you before hand.I would love to meet you too.